A distinctively Canadian art movement began just after the First World War and flourished in the twenties. This group of artists was called the Group of Seven. 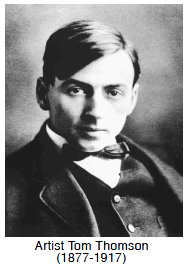 Artist Tom Thomson was an early friend and contemporary of the group. He died in a mysterious canoe accident in Algonquin Park, Ontario in 1917 at the age of 40. The Group of Seven, who first exhibited together in 1920, were trying to capture the essence of the Canadian spirit through their abstracted landscapes, mostly of the Canadian shield area of northern Ontario. They wanted to move away from copying European styles and subjects and express a distinctly Canadian vision. Their names were Lawren Harris, Arthur Lismer, Franz Johnston, J.E.H. MacDonald, Frank Carmichael, A.Y. Jackson and F.H. Varley. Johnston left the group in 1924 and was replaced by A.J. Casson in 1926. 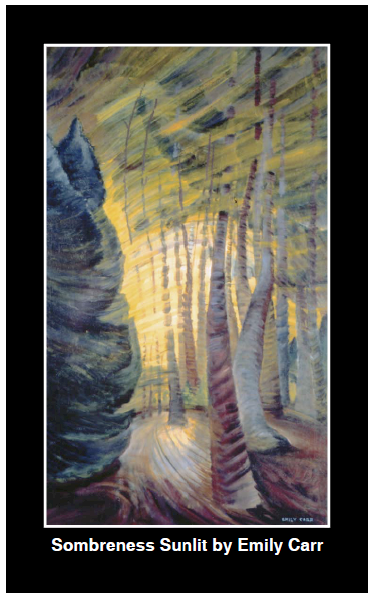 Emily Carr, working by herself in British Columbia, was also developing a strong abstract style to depict the haunting rainforests of the west coast. She often travelled to remote settlements along the rugged coastline and painted scenes of the rapidly disappearing Haida culture. 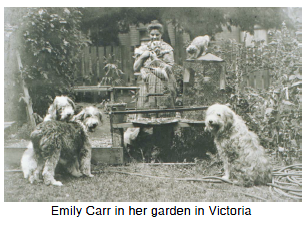 At home in Victoria, Carr kept quite a menagerie of beloved pets. 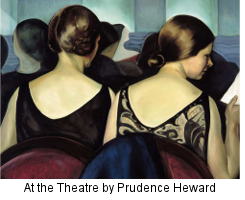 Another modernist art movement in Canada in the 1920s was centred in Montreal and called the Beaver Hall Group. It was a loose association of like-minded artists, many of whom shared studio space at 305 Beaver Hall Hill. It was one of the first groups of professional artists that included women. Of the nineteen artists featured in their first major exhibit in January 1921, eight were women. In contrast to the landscape painting that characterized the Group of Seven, the Beaver Hall artists focussed on urban scenes and figurative painting. One artist who spanned both groups was A.Y. Jackson. Other Beaver Hall artists included Edwin Holgate, Prudence Heward, Lilias Torrance Newton, Randolph Stanley Hewton and Mabel May. Most of the group also shared a common mentor, having studied under William Brymner, who encouraged them to explore modern ideas in art. More Canadian writers were beginning to emerge in the 1920s. A group of McGill university poets became known as "the Montreal group" - F.R. Scott, A.M. Klein, Leo Kennedy and A.J.M. Smith. Quebecois writers like Ringuet and Alfred Desrochers focussed mainly on describing rural life in the twenties and Ringuet's novel, Thirty Acres, was the first to describe Quebec farm life realistically. Stephen Leacock was writing humourous essays and Mazo de la Roche published her romantic epic, Jalna, in 1927. The Bluenose was launched in Lunenburg, Nova Scotia in 1921. This schooner was a prize winner both as a racer and a fishing vessel for almost 20 years. Its image is on the back of the Canadian dime.